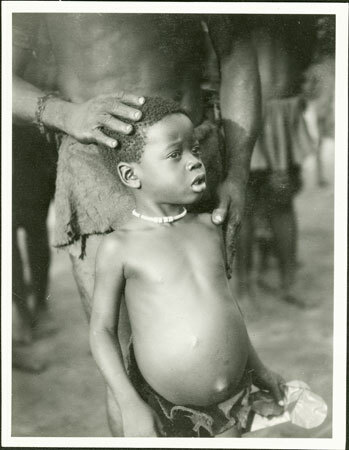 A portrait of a small boy (identified as Batibanga) wearing a beaded strung neck ornament, with a man standing behind him with a hand on the child's shoulder and head, probably keeping the head turned to one side at the instruction of the photographer. The boy's abdomen is slightly distended, probably a result of a degree of malnutrition. Notes on print/mount - "+33 5 EPA580"
Morton, Chris. "Zande boy" Southern Sudan Project (in development). 03 Jan. 2006. Pitt Rivers Museum. <http://southernsudan.prm.ox.ac.uk/details/1998.341.580.2/>.